Wanaka, New Zealand – Treble Cone Ski Area in Wanaka yesterday announced plans for a new gondola to provide access from the valley floor to the alpine ski and snowboard resort. 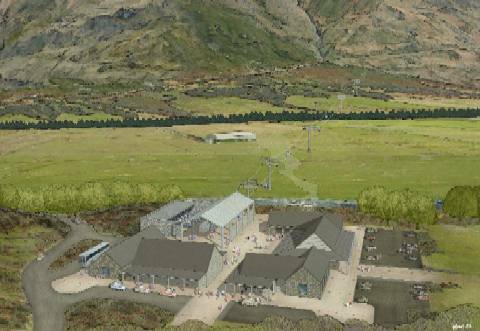 A resource consent application has recently been lodged to provide for the ski lift link and its associated buildings. The proposal will offer safety and efficiency improvements, as well as providing visitors with a greater level of enjoyment and customer service, proposal backers say. The proposed gondola would take 2,000 passengers per hour, up the 945m vertical rise from Cattle Flat to the ski area. The 3.3km trip would take 10.5 minutes, a significant saving on existing drive times. The new project marks the first alpine gondola in New Zealand. This project will have a landmark effect on year round tourism in New Zealand, according to gondola sponsors. The gondola base buildings have been designed to reflect a homestead and farm buildings of a form traditionally associated with high country stations of the Southern Alps. The buildings will provide for gondola machinery and cabin storage, as well as the ticketing and commercial functions associated with the ski area. Last year the Southern Lakes Ski Areas contributed NZ$182 million to New Zealand’s economy. Offshore and especially Australian visitors were recognized as being the highest value winter visitors to the region. Australian skiers are more familiar with on-mountain accommodation and facilities for direct access to the mountains. Treble Cone believe that by providing world class access facilities, the region will be able to attract domestic and international visitors which would not normally consider New Zealand as a winter sports destination. Initial construction of the NZ$20.0 million gondola is likely to take 10 months. Other associated facilities covered in the application will then be staged according to utilization. The establishment of the facility will support 13 full time jobs during construction and three full time jobs on an ongoing basis. Initiation of the Gondola project has been made possible by the completion of Tenure Review at Cattle Flat Station. Land and easements necessary for the proposal, have now been released from the restrictions previously imposed as part of the Crown Pastoral Lease. I can’t tell if this story above is SATIRE or not, because we already have MASSIVE snow all over the place and it is only October 5. As of midday Saturday, a trained spotter reported 48 inches of snow near Deadwood, S.D.